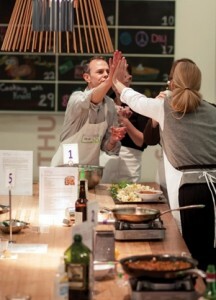 Early this month we brought you an event recap from a sunny Seattle corporate cooking party. Now, it’s on to Portland we go. Funny enough, our gal Carolyn experienced and wrote about both of these events — that’s what you get when you’re the “Northwest Manager”! Take it away, Carolyn. One of the reasons why I love working with Parties That Cook is the variety of culinary experiences we offer. I can trust that, as a chef, my experience at each event will be just as varied as that of our guests. For the longest time, our Sumptuous Small Plates format was my favorite. 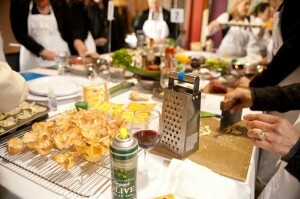 Guests not only cook together, but also mix and mingle like at a cocktail party! And who doesn’t love a good cocktail party?? Another favorite of mine has been the intense Kitchen Challenge. This high energy event brings out the competitive edge in our guests, testing their creativity as they come up with their own recipes using our pantry of ingredients. Recently, a new Family Style twist to our classic Chef’s Table event has caused a shift in my list of favorites. The words “Family Style” evoke nostalgic memories of everyone gathered around the dinner table, enjoying each other’s company. The magic of cooking together continues at the dining table when the platters of food come around. You see one guest holding the platter while a neighbor serves both of their plates. It’s a great display of sharing, teamwork, and complimenting colleagues on a job well done – isn’t that what team bonding is all about? 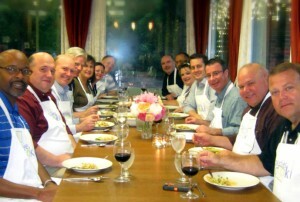 Up in Portland, a group from Intel recently experienced the magic of our Chef’s Table, Family Style. 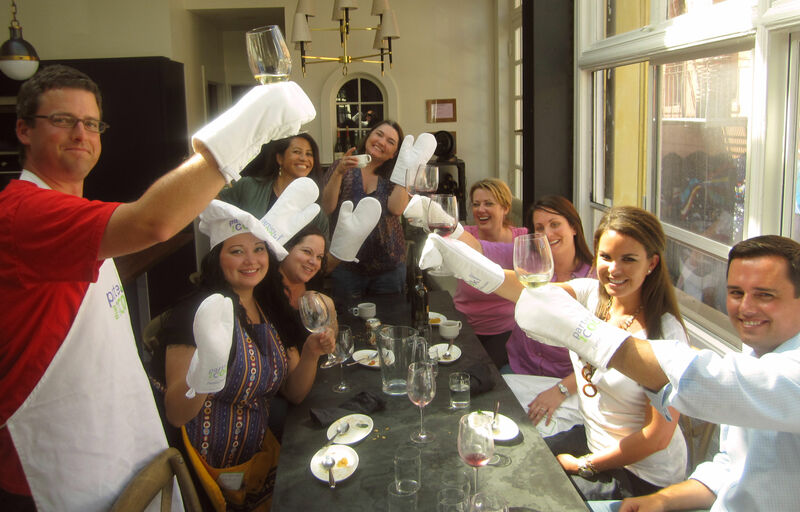 Intel host, Cari Williams, had told us that her group was going to be in back-to-back corporate meetings, and our cooking event was a natural team building extension. 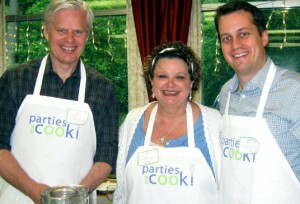 What better way to strengthen connections and unwind than at one of our cooking parties? We knew our Family Style format would be perfect for this group. 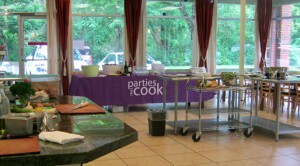 The group arrived at one of our favorite venues, In Good Taste, where we had all the cooking stations set up. We greeted guests with a beverage and bites from our antipasti platter. After a brief skills demonstration, the cooking began. Guests commented on how much fun it was, and seemed to really enjoy spending time together. Kari later commented, “It was great team work. The event was successful because the PTC team did a fantastic job setting expectations ahead of time.” Want to know what they cooked? Ready, Set, Drool! The food was exceptional and everyone was so proud of what they had created! We heard lots of “Ooh’s” and “Aahh’s”, “How beautiful”, “This smells so good!”, “Looks delicious!”. Guests also took home a brand-new PTC apron. According to Cari, “Having the aprons was a hit. We took them back to our team meeting and signed them so each member has an apron with all of our signatures…makes for a nice memento.” A few guests wanted to continue honing their culinary skills at home, so our Small Plates Recipe Deck was the perfect take home for them. What nice souvenirs! Big thanks to Cari and her Intel team! We loved cooking with you and are so glad you experienced the magic of our Chef’s Table, Family Style. Hope to see you in the kitchen again soon!